Powers/Abilities: A natural genius when it comes to designing and constructing advanced machinery, the Dazzler came up with a light-manipulating costume that can blind or disrupt his victim's nervous systems. He also created costumes for his henchmen that emitted minute chemoid particles, which he could trace with his "dazzler-beams". These particles could also be turned into antimatter, resulting in deadly explosions if any of his men chose to betray him. Dazzler's other inventions included ray blasters, a teleportation device, a giant diamond-powered laser, and a brainwashing machine. (Marvel Tales II#30 (fb) - BTS) - Burtram had served an extended prison sentence for unrevealed crimes. 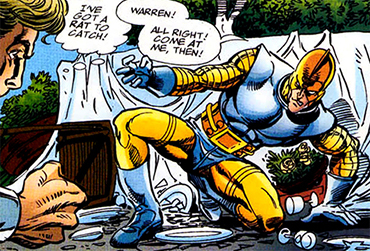 Upon his release, he asked his brother Warren Worthington II to help him turn a new leaf. Unknown to his brother, Burt also started an illegal diamond smuggling syndicate, planning to use this operation as a stepping stone to conquer the world. (Ka-Zar I#2/2 - BTS) - Burtram used his fortune to secretly construct a hidden headquarters at the foot of the Statue of Liberty. 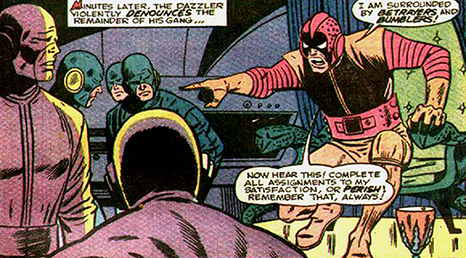 Using all of his inventions, he created the costumed criminal identity of the Dazzler. He hired several down on their luck vagrants as his henchmen, outfitted them with special costumes, and embarked on a crimespree that soon caught the attention of the FBI. (Marvel Tales II#30 (fb) - BTS) - When he discovered Burt's underground diamond smuggling ring, Warren was so shocked he threatened his brother he'd inform the authorities. Afraid to go back to jail, Burt decided his brother had to die. (Ka-Zar I#2/2 - BTS) - Dressed as the Dazzler, Burt ordered his henchman to rob a bank, armed with a huge battering ram and ray guns. (Ka-Zar I#2/2) - The robbery was spotted by the high flying Angel, who decided to intervene without calling his fellow X-Men for backup. Angel succeeded in stopping the crime and knocked out most of Dazzler's henchmen. Two managed to escape however, and returned to their hidden base where the furious Dazzler learned they had failed. He then decided to actively pursue his brother's death, preferably through his most recent invention: the ray-blaster. Burt remained blissfully unaware of the fact his men had been thwarted by his own nephew. When two of Dazzler's henchmen killed Warren Worthington II, the Angel sensed his father's passing and used his mutant sense of direction to locate the murderers. They unsuccesfully tried to escape using Jet Pogo Sticks, and after the enraged Angel pounded one of the killers, the FBI and police took them in. 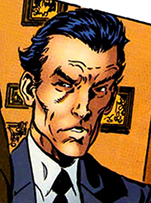 FBI agent Fred Duncan informed Angel the men belonged to the Dazzler's gang, which made the young mutant swear revenge on the criminal he didn't know was actually his uncle Burt. (Ka-Zar I#3/3) - Frustrated his men hadn't returned from the hit on his brother, Burt decided to actively look for them by using the chemoid particles in their costumes as a homing beacon. Locating them at a police station, Dazzler activated the microphone system sown into the costumes to listen in. Through the audiofeed, he learned that his accomplices were about to throw in with the police and tell on him. Not wasting a second, he shifted their chemoid particles into antimatter and killed them instantly. Furious, he scolded the other members of his gang for being lazy. He then came up with a new scheme that required them to kidnap his nephew Warren Worthington III and bring him to their hidden base. After successfully capturing the young teen, Warren managed to break out by putting on his Angel costume and simply flying through an air vent. On the way out, he overheard the Dazzler telling his men about his upcoming big hit. Understandably angered, the Angel attacked and almost defeated his enemies. However, Dazzler then revealed he had Warren's girlfriend Candy Southern captured and in stasis. Shocked and demoralized to see his lover so helpless, the Angel gave up the fight and was unmasked, revealing his civilian identity. (Marvel Tales II#30) - Following his nephew's example, the Dazzler revealed his true identity as well. He informed Warren why he killed his brother and how he planned to conquer the world by placing the world's largest diamond in the power-cell unit of his spatial destructor machine. He told Warren he expected him to get the diamond and used a brain washing machine on him to ensure his cooperation. Unbeknownst to the Dazzler, his machine was unable to affect mutants, but Angel decided to play along. He went out as ordered and retrieved the diamond from the mob, who in turn had stolen it from a maharajah. However, he switched the diamond with a fake and gave the copy to the Dazzler who unwittingly used it to power his spatial destructor. The fake gem caused the machine to malfunction and explode, which resulted in widespread fires inside the base. Fearing an imminent explosion, Angel grabbed both Candy and the Dazzler and flew off moments before the base went up. High in the sky, the furious Dazzler still tried to have his revenge by punching Angel and forcing him to drop both Candy and himself. Angel only managed to rescue Candy, watching his uncle seemingly fall to his death. (X-Men: Hidden Years#13 - BTS) - Through unknown means, Burt survived his fall from the sky. To his surprise, the Angel never revealed his dual identity as the Dazzler to either the police or the FBI, allowing him free reign. 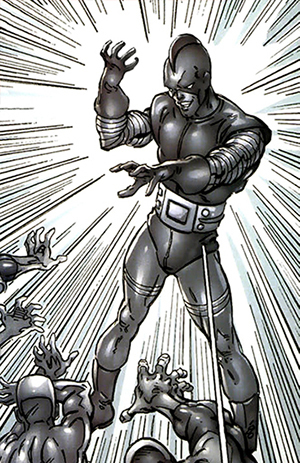 He also gained greater control over his light manipulating abilities, which allowed him to use his powers even without the machinery in his costume. (X-Men: Hidden Years#13 (fb)) - Strapped for cash, Burt decided to get his hands on the Worthington family fortune by romancing his brother's widow Kathryn. The vulnerable Kathryn was still mourning her husband, but Burt was able to gain her trust and before long her love. At the same time, he planned her death when he allied himself with Doctor Stuart, the Worthington family physician, who agreed to alter Kathryn's medication so she'd be slowly killed even as she and Burt prepared to get married. (X-Men: Hidden Years#13) - Burt and Kathryn recalled how they had met. Totally unaware of her son's past with Burt as the Dazzler, Kathryn hoped Warren would be able to attend their wedding. (X-Men: Hidden Years#14) - When Warren learned his mother was about to marry his father's murderer, he took Candy and the other X-Men to the Worthington estate in Centerport, Long Island. When confronted by the X-Men Burt used his light powers to impress the young mutants in their civilian guises. He declared he could use his new light powers to even fry their nervous systems at any given time. He quickly powered down when a severly weakened Kathryn entered the room, accompanied by Doctor Stuart. When Burt escorted his bride, Doctor Stuart told the X-Men that Kathryn was so frail, she wouldn't survive if she learned the true identity of her future husband. (X-Men: Hidden Years#15) - In the presence of Kathryn, Burt asked Warren to be his best man at the wedding, hoping his nephew would give their marriage his blessing. This understandably upset the teenager, but he managed to restrain himself for fear of inadvertently causing his mother undue stress. He simply agreed and excused himself. Later that day, Doctor Stuart warned Burt that he had been overdosing his bride to be too. At this rate, she wouldn't survive long enough to see the wedding day. This made Burt decide he had to get rid of the X-Men before they could cause any further trouble. Donning an updated version of his Dazzler costume, he attacked the team but was ill prepared for Cyclops' optic beam that blasted him through the mansion's windows and into the garden. The Angel then jumped him, repeatedly hitting his face and giving in to his pent up anger. Beast and Cyclops had to pull Warren off the Dazzler, afraid he might kill his uncle. Marvel Girl then ended the Dazzler's threat by telepathically locking Burt's powers. Before he was incapacitated, Burt revealed Doctor Stuart's involvement. By then, Kathryn had already succumbed to the poisoning and died in her son's arms as he carried her up into the clouds like his namesake. (X-Men: Hidden Years#16 (fb) - BTS) - Marvel Girl placed special memory blocks in the minds of both Burt and Stuart, preventing them from recalling anything about the true identity of the X-Men. (X-Men: Hidden Years#16) - Burt and Dr. Stuart were taking into custody by the police. (Exiles I#28 (fb) - BTS) - Maximus Lobo became allies with Burt Worthington and frequently shared information about experiments in genetic experimentation. The story-line from Ka-Zar I#2 follows X-Men I#46. For an alleged genius, the Dazzler sure was a rather eccentric megalomaniac who didn't have the strongest grasp of logic. For instance: How secret do you think a hidden base is if you build it underneath one of the major tourist attractions in one of the largest cities of the world...a base your henchmen access via jet propelled pogosticks. Unless those sticks came with an unrevealed cloaking field, it's kinda hard to keep your hideout a secret. In Uncanny X-Men I#417, Maximus Lobo revealed to the Angel he was the one who killed his father, Warren Worthington II. If this was just a ruse or if Lobo was actually one of Dazzler's henchmen remains to be seen. Thanks to Norvo for adding the information from Exiles. Charlie and several others unnamed on panel. The Dazzler's gang consisted of down on their luck vagrants who were subservient to his every whim because of the special costumes he forced them to wear. Not only did they contain two way communication gear that the Dazzler could use to listen in on them, the fabric of their uniforms was also laced with chemoid particles that allowed Dazzler to track his henchmen's every move by focussing his "dazzler-beams" on the particles. If any of his gang displeased him, Dazzler could change the nature of the chemoid particles to antimatter, which ensured the wearer died instantly. In theory, these features would make his henchmen completly loyal. 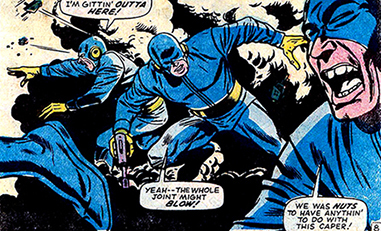 Dazzler's gang used specialized ray-blasters by the villain's own design and used Jet Pogo sticks for transportation. It's possible the entire gang died in the explosion that destroyed the secret Lady Liberty base.